We are a social network that offers affordable infrastructures, provides tailor made services and organizes inspiring activities to support our members. We aim at developing a sustainable economic model by supporting initiatives around and about circular economy. Based on the principles of sharing and collaboration, we work as a hub and promoter between start-ups, innovative projects, the neighbourhood and the broad public. Waste becomes a resource for new materials, creations or objects. Contact us for your own limited edition of the “MicroBook” ! 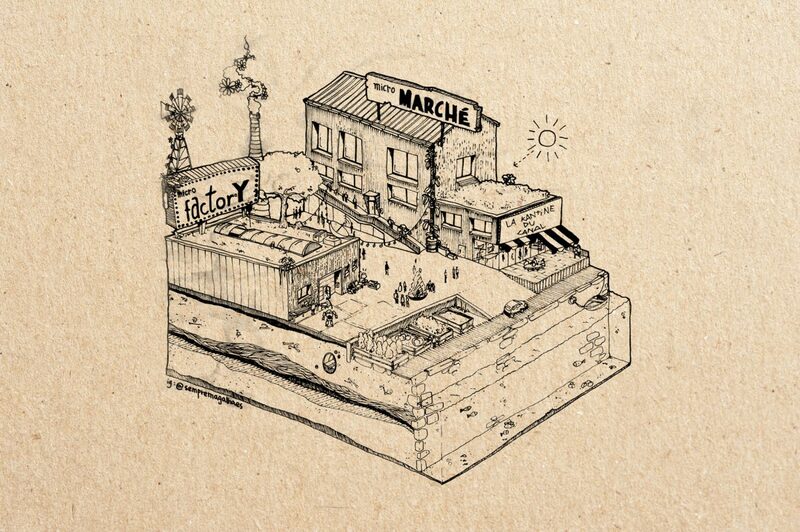 In 2006, De Overmolen, Beurschouwburg and City Mine(d) started the original market project “MicroMarché”. A social-economic and cultural market that focused on research, training, political change and experimentation. The first market days started in 2007, every Sunday together with the midi market (south station), and later at Nouveau Marché aux Grains (Dansaert street). On 14 July 2009, we opened the doors of our own venue Quai à la Houille 9, in the center of Brussels. In collaboration with more than 20 organizations and installing our own bar and event rooms… the project came to life. In 2013 the market came to an end, and so we had to redefine our organization and the functionality of it. A new collaboration was necessary, which brought the birth of “MicroFactory” in 2014. Finally in 2016, after being asked to leave our old home, we had to decide if we call it game over or keep going and find a new roof over our head… And so we did!! The summer of 2016, MicroMarché, MicroFactory and a bunch of old and new friends moved to RECY K (Anderlecht), where we discover the world of recycling. Together with our partners and our new landlord, Net Brussel – Bruxelles Propreté, we keep growing our community and developing the project of tomorrow. If you are interested in reading more about the history (2006-2016) of MicroMarché, and supporting our project at the same time, contact us for your own limited edition of the “MicroBook” !